The Amsterdam Rainbow Dress is a work of art that calls for openness and inclusiveness, encouraging people to actively contribute to, defend and share (acquired) freedoms. 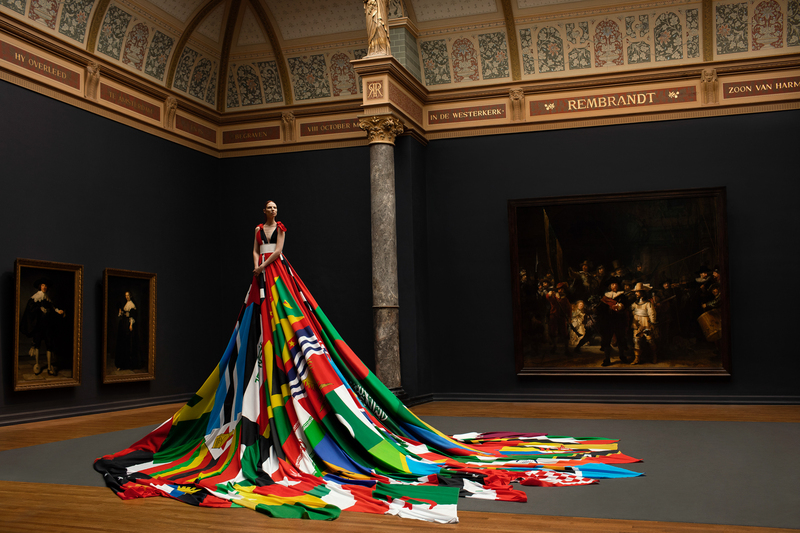 It is a monumental dress, measuring over 16 metres / 52 feet in diameter, made of 75* national flags from countries where homosexuality is punishable by law, including 8 countries where homosexual acts can result in the death penalty. The bodice of the dress is made from the city flag of the city of Amsterdam. To raise attention to the issue of illegal homosexuality, the flags were carried in the Pride Walk parade on the opening day of Euro Pride 2016, after which they were presented to the four initiators of the Amsterdam Rainbow Dress Foundation. Mattijs van Bergen, Arnout van Krimpen, Jochem Kaan and Oeri van Woezik joined together and developed a concept for these flags which led to the creation the Amsterdam Rainbow Dress, in cooperation with volunteers of COC Amsterdam. The Amsterdam Rainbow Dress is made of the 75* national flags under a bodice made of the Amsterdam city flag. This underlines the importance of Amsterdam remaining open to LGBT+ refugees who are persecuted in their country because of who they are or whom they love. For centuries, Amsterdam has been a shelter city for people in other places in the Netherlands, Europe, or the world who were not safe for the ideas they had or the person they were. Amsterdam as a ‘safe haven’, also for LGBT+ refugees from the 75* countries represented in the Amsterdam Rainbow Dress, is not self-evident and needs to be cultivated and maintained. It is therefore important that the people of Amsterdam remain aware of this goal and are committed to develop an atmosphere of openness and inclusiveness. Naturally this applies to communities all over the world and that is why the dress will travel, raising awareness for openness and inclusiveness around the globe. This is what the Amsterdam Rainbow Dress stands for. As woman and transgender, top model Valentijn de Hingh knows better than anyone how to convey this message. She presented the Amsterdam Rainbow Dress to the public at the Amsterdam Museum and also modelled the dress in the stunning publicity photos shot by photographer Pieter Henket at the Rijksmuseum in the summer of 2016. These publicity photos were shot in the Gallery of Honour, in front of Rembrandt’s Night Watch. The Rijksmuseum, the Gallery of Honour and the Night Watch are considered iconic and historic Amsterdam / Dutch. By photographing at this specific site, these pictures underline the history of Amsterdam as an enclave of freedom for all. Valentijn de Hingh poses as the maid of Amsterdam, who welcomes 180 nationalities within her city limits and thus also welcome, or in any case should welcome, LGBT refugees from the 75* countries. During an LGBT+ focused mission traveling from Amsterdam to San Francisco with Amsterdam deputy mayor Simone Kukenheim, the Amsterdam Rainbow Dress Foundation was, with the support of the Netherlands General-Consulate in San Francisco, enabled to create a second set of art photographs underlining the importance of awareness with regards to state-sponsored homophobia and those affected by it. 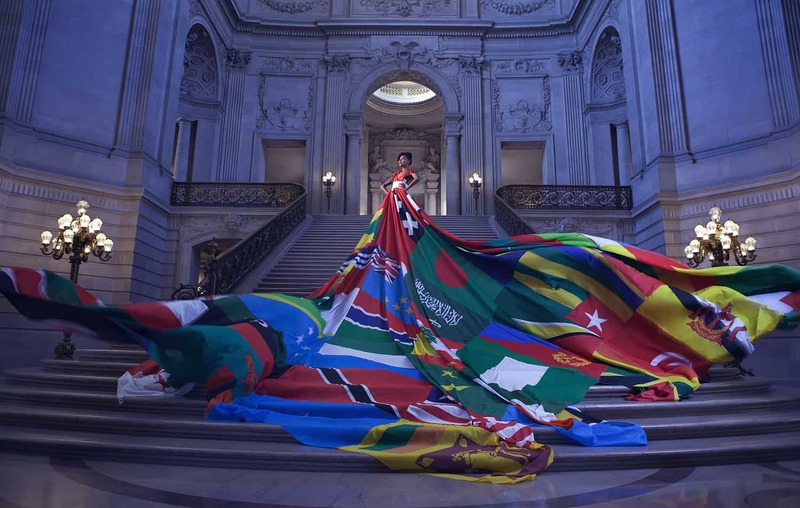 Set in San Francisco City Hall’s grand rotunda and produced on Harvey Milk Day 2017, acclaimed photographer Ashlynn Danielsen captures top model Glo Taylor as she embodies the guardian of strength, resilience and progressiveness of San Francisco’s community. With a fully LGBT+ related crew from the Bay Area, this production again emphasizes the Amsterdam Rainbow Dress’ focus on creating a platform for the community. The Amsterdam Rainbow Dress is a ‘living’ work of art. If and when any of the countries in the dress no longer penalise homosexuality, the flag will be replaced with the rainbow flag. On Friday, August 5th, 2016, the Amsterdam Rainbow Dress was first presented, in the courtyard of the Amsterdam Museum. The accompanying art photographs, shot by acclaimed photographer Pieter Henket with LGBT+ activist with transgender top model Valentijn de Hingh, have been widely published by international media; within a week the stunning images went viral on various media and got picked up by (online) written press and television stations worldwide. These publications include Dutch national newspaper Het Parool, Huffington Post, El Pais, the Independent, USA Today, Art Daily, Vogue, Cosmopolitan, BuzzFeed, the Gaily Grind, Upworthy, the Guardian and CTV News Channel. Attention is soon paid to the Amsterdam Rainbow Dress from the Netherlands to China, from Australia to Brazil and the United States to the United Kingdom. In countries that are included in the dress, such as India and Malaysia, online discussion was initiated as a result. In September of 2016, the Amsterdam Rainbow Dress joins a big arts and culture mission to New York City, led by Amsterdam deputy mayor Kajsa Ollongren and aimed at promoting Dutch culture, design and art in the Big Apple. A total of 112 delegates representing 66 organizations and 12 start-ups contributed to a vibrant program the cultural relationships between Amsterdam and New York. May 2017, the Amsterdam Rainbow Dress Foundation was invited by the Netherlands ministry of Foreign Affairs to join a program with the Equal Rights Coalition on the annual International Day Against Homophobia, Lesbophobia, Biphobia and Transphobia (IDAHOT). With all ambassadors from the Coalition, foreign minister Bert Koenders and a group of LGBT+ activists, allies and additional prominent guests and speakers present, the Amsterdam Rainbow Dress was presented at the ministry in The Hague, preceding a discussion on current LGBT+ affairs. Also in May 2017, the Amsterdam Rainbow Dress Foundation joins an LGBT+ focused mission from Amsterdam deputy mayor Simone Kukenheim, traveling to San Francisco to tighten bonds, establish dialogues and exchange knowledge, experience and awareness within the fields of art, healthcare, law enforcement, education, politics and business. * List of countries as comprised by the International Lesbian, Gay, Bisexual, Trans and Intersex Association (ILGA). The flag of Belize has since been replaced with the rainbow flag. The Amsterdam Rainbow Dress in her current form consists of 75 national flags, 1 rainbow flag and 4 flags of the City of Amsterdam. Image: Valentijn de Hingh presents the Amsterdam Rainbow Dress in the Gallery of Honour at the Rijkmuseum, in front of Rembrandt’s iconic Night Watch. Image by Pieter Henket Studio.